- 10-14th of September: participating artist at The Big Draw Nijmegen, The Netherlands. I made drawings at the Valkhof Museum and at De Dromaai. - 13th-22nd of September: Festival de Basis, Soesterberg, The Netherlands. - 23rd-25th of August, 30th of August-1st of September, Utrecht Down Under, Utrecht, The Netherlands. - 7th of July: Festival Eigenwijzer, Utrecht, The Netherlands. - 25th of May - 23rd of June: 'En toen wisten we alles', Kunstliefde, Utrecht, The Netherlands. - 21st of April: Joyce' crochet designs were featured at the Hip & Handgemaaktmarkt, Nijmegen, The Netherlands. - 28th of September: Discovery Festival Rotterdam, Erasmus MC, Rotterdam, The Netherlands. - 27th-29th of July: 'Joyce Overheul | Selected Works', Off the Hook Gallery, Sweden. - 28th June - 1st July: Graduation Exhibition at HKU, location Tractieweg, Utrecht, The Netherlands. - 17th-28th of May - 'Longing, Belonging', Academiegalerie, Utrecht, The Netherlands. - 28th of April - 'Three Graduating Students', Stichting Magdalena, Hilversum, The Netherlands. - 13th of April - 12th of May:'Three Artists Walk Into A Bar...', De Appel, Amsterdam, The Netherlands. - 9th, 10th and 11th March: 'DUO', Das Spectrum, Utrecht, The Netherlands. - 10th of February: Charity sale at Coffee Company, Utrecht, The Netherlands. - 20th of January - 18th of February: 'Conversation Pieces', Academiegalerie, Utrecht, The Netherlands. - 15th of December: exhibition during WILDGROEI at EKKO, Utrecht, The Netherlands. - 6th - 13th December 2011: IXPO, HKU, Utrecht, The Netherlands. - 9th of September - 6th of November 2011: Library of Medical Sciences, Radboud University, Nijmegen, The Netherlands. - 24th of June: Kerkennacht Wilhelminaker, Utrecht, The Netherlands. - 18th June: Festival De Beschaving. University of Utrecht Science Park, Utrecht, The Netherlands. - 10,12,13,17,18 & 19th June: Urban Spectator, Stichting Magdalena, Hilversum, The Netherlands. - 27th April: Presentation Dr. Pill documentary @ HKU, Tractieweg 41, Utrecht, The Netherlands. - 10th August - 10th October: De Museumwinkel, Nijmegen, The Netherlands. - 12th June: Defqon1, Almere Strand, Almere, The Netherlands. - 28th Januari: Studentenexpo HKU, Utrecht, The Netherlands. - 19th and 20th December: Studenten Huiskamer EXPO, Utrecht, The Netherlands. - 18 June: Artist talk about 'The World's Most Exclusive Membership'at the School of Social Media, Zwolle, The Netherlands. - 7th of March: 'Sappelen', LUCY LIVE, a artist talk about my artistic practice at Das Spectrum, Utrecht, The Netherlands. - 28th of September: 20PK, Discovery Festival Rotterdam, Erasmus MC, Rotterdam, The Netherlands. - Artist-in-Residence at the Kinderdijk Project, Kinderdijk area, The Netherlands. - Participant of De Belofte 8, a project for freshly graduated students of Genootschap Kunstliefde, Utrecht, The Netherlands. - Artist-in-Residence at the Off the Hook Gallery, Årjäng, Sweden. - Joyce was one of the artist assistants of Paul Ryanat dOCUMENTA(13), Germany. 2017, organza, sewing thread, nylon and iron wire. 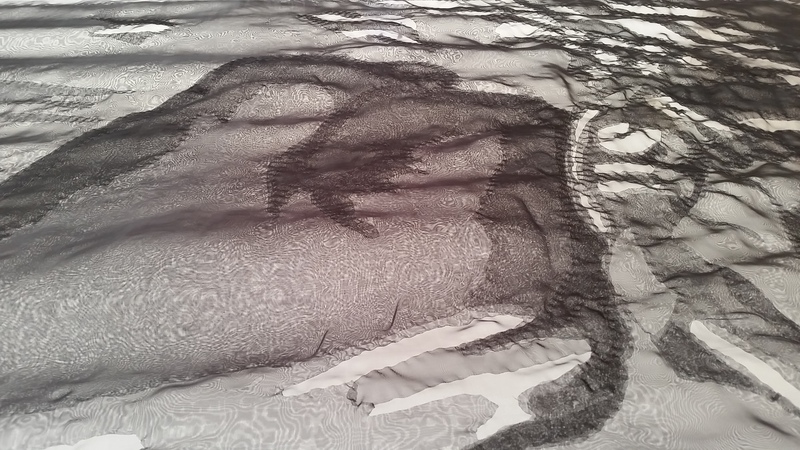 As part of the Soft Series and as part of Overheul's artist-in-residence at Kunsthal45, Den Helder she made a partially hand-sewn scale 1:1 transparant naval mine. The mine is made from transparant rainbow organza, transparant busks and multi-coloured nylon sewing thread. 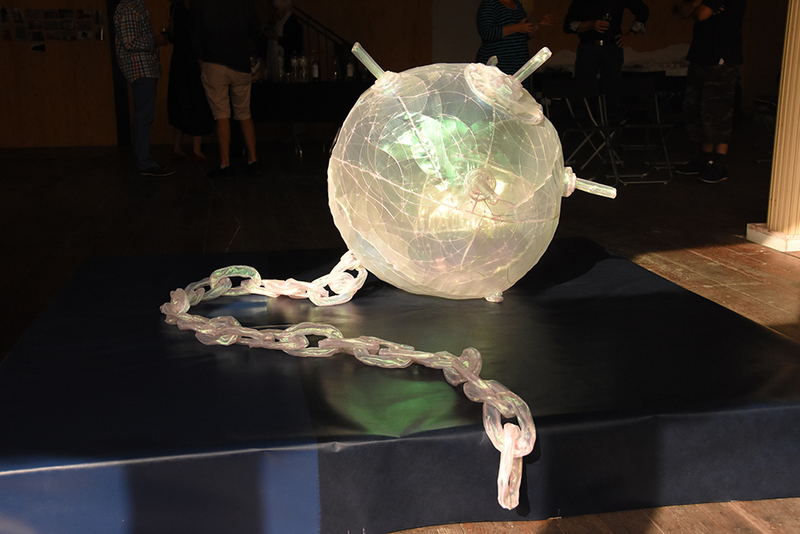 The ball-shape is 70cm in diameter (excluding the spikes), the mine also has a three meter long chain. The soft series are a series of weapons made of fabric, which Overheul started in 2015 with a scale 1:1 replica of a Kalashnikov rifle. With these objects she want to research the contrast between the original and current state of each weapon: harmful and deadly versus soft and totally useless, except for its visual beauty. All weapons are hand-sewn, this way Overheul want to create a parallel between the designers and makers of the original weapons and the ones she made later on. It’s extremely difficult to design and create a well-functioning weapon and therefore it takes a lot of time, care and dedication to complete it. Overheul also finds it very interesting to see what kind of love-hate relationship some weapon designers had with their creations: Mikhail Kalashnikov, for example, felt extremely guilty for the last decades of his life because his deadly invention was just too successful. For him it was a continuous struggle with his conscience of what he had done. 2018, triptych made from wood, gold paint, holographic plastic, embroidery floss, nails, aluminum wire. 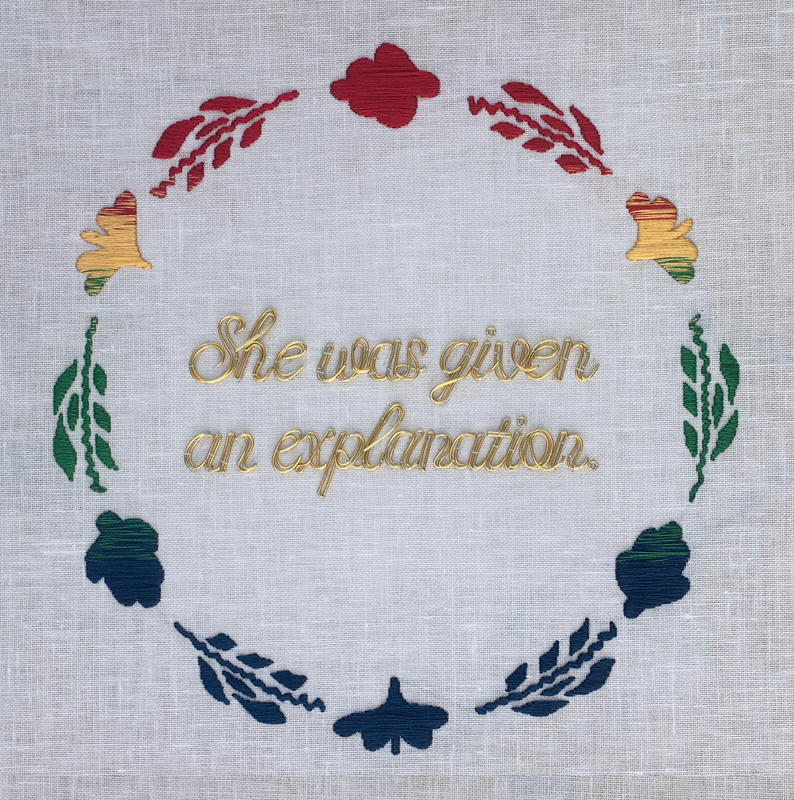 For the exhibition project 'La Casa de María Hernández' at IMJUS, Mexico City (MX) Overheul designed multiple embroidered works with recent quotes from the current feminist movement. The exhibition at IMJUS was held in order to give a response to women's rights in Mexico current day and the way International Women's Day is used by male abusers to make up for all bad things that they inflicted upon women in past. María Hernández is the most common name for women in Mexico and was therefore chosen to represent 'the' Mexican woman and her life. 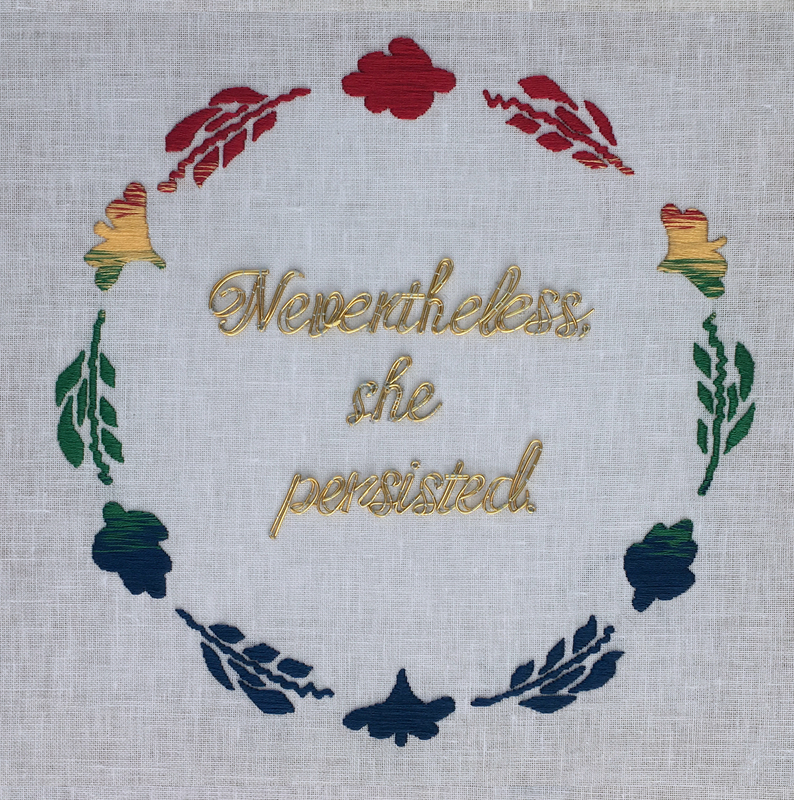 "Nevertheless, she persisted" is an expression adopted by the feminist movement, especially in the United States. It became popular in 2017 after the United States Senatevoted to silence Senator Elizabeth Warren's objections to confirmationof Senator Jeff Sessionsas U.S. Attorney General. Senate Majority Leader Mitch McConnelluttered this sentence during comments following the vote in an effort to defend the Senate's actions and blame Warren. "Senator Warren was giving a lengthy speech. She had appeared to violate the rule. She was warned. She was given an explanation. 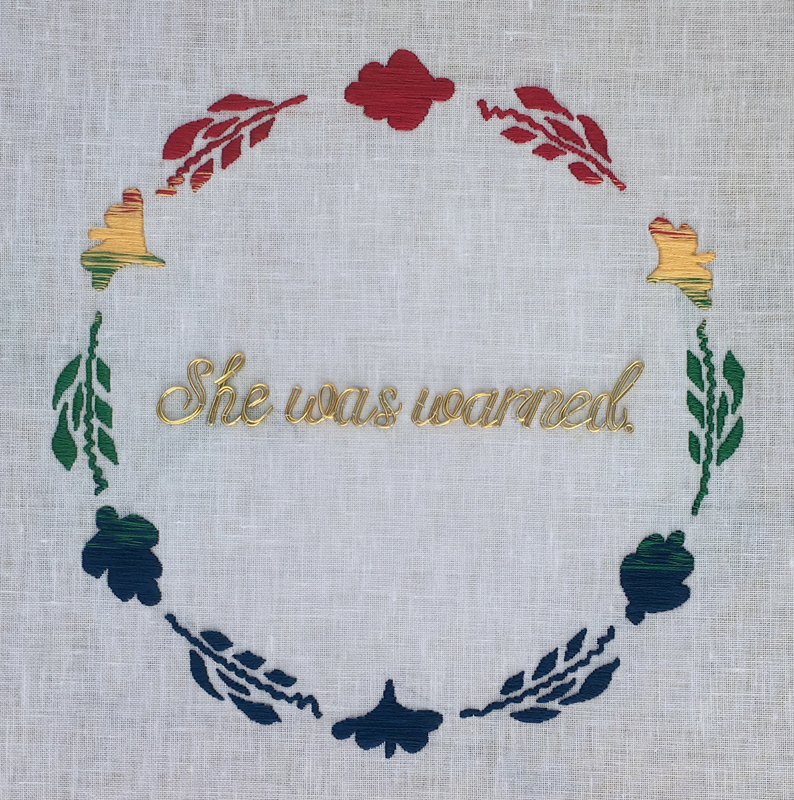 Nevertheless, she persisted."